February is here and if you ask us, it’s still much too cold outside. We suppose that’s nothing new for us Canadians, after all, we have been born and bred in the cold. But we reckon that it’s the perfect reason to warm up with some of your loved ones and share a fresh, warm crepe! A fairly new holiday for us Canucks, Family Day, falls on the 17th this month. After enduring the winter for this long, it’s going to be a holiday that’s much appreciated by banks, schools & libraries. If you want to make the holiday a bit sweeter, some malls will be open on family day and we will be waiting for you! Check the respective mall websites for details. The 14th has always been the main focal point of the month. For decades, men and women have shown their love for each other in the form of gifts, chocolates, and grand gestures, all in the name of St. Valentine. Now, the history behind the love shared on this day isn’t exactly clear, but it doesn’t matter, because your significant other will be expecting something regardless. Don’t worry, we’ve got you covered. With all the love this month, we had to show our love to you with a monthly feature that was truly delicious. 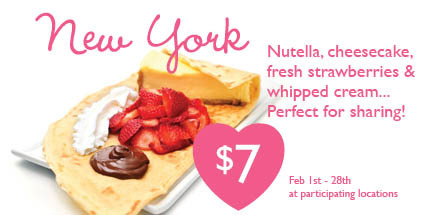 This month only, enjoy our New York crepe for only $7! A real slice of cheesecake, fresh cut strawberries, nutella and whipped cream will make for a dessert your love won’t soon forget. A deal this good only happens once a year, so get out there, share the love and savour every bite!